Shooting great video doesn’t have to be a time-consuming process. By streamlining your workflow and limiting the chance for mistakes, you can reduce the time needed to shoot and edit your masterpiece. One of the areas I’ve been thinking quite a bit about during the last couple of years is participatory culture. I even wrote my master’s thesis on that topic (get it in Danish) No doubt it’s a broad and not very well defined area. But in essence it’s a culture with increasingly low barriers to creative expression and civic engagement. So, you’ve got some time on your hands, regardless if you are a student on summer vacation, an employee on furlough, or a professional in between jobs. Whatever the scenario, I have got a great list of resources to keep you busy for days. I have quickly realized that our industry loves lists — on tips, software, tools, projects — so I decided to make a Top-85 collection of these lists. All together, the list below points you to more than 2,730 articles, projects, tools and tips in eight broad categories. Whew, don’t get overwhelmed. Just use this as inspiration to make the most of your free time — there is something here for everyone! Common sense tells us that print is not going away. If print is no longer an important part of your life, that is undeniable. But to extrapolate from personal experience to a statement about what is going to happen in the world doesn’t work. But that’s exactly what many of the people foretelling the death of print are doing. That’s because most of the public discourse tends to be dominated by information junkies and there is little doubt that if you’re an information junkie, the web is the way to go. But the reality is that info-junkies are only a small tribe. They consume the news at a prodigious rate and the web is the fastest way to satisfy their appetite. Thus, they’re also the most vocal tribe — so it’s easy to get the impression that theirs is the most widely held conclusion. But if you listen to some of the discourse, it soon becomes apparent that it’s only one way to look at it. Not just because the New York “Twimes” sounds kind of cool — but because of the economics of news. News is about what’s timely. There’s nothing more timely than Twitter. Twitter would provide the NYT with four key resources and capabilities. Enough already. Partial facts and misinformation about newspapers are distorting the view for everyone, including readers and advertisers. Let’s set the record straight: Newspapers still enjoy considerable readership and deliver strong results for advertisers. More Americans read printed newspapers than watch the Super Bowl. More Americans read printed newspapers than own dogs. Newspapers and their Web sites reach a larger audience than ever before. The crisis facing newspapers is not an audience problem. It is a revenue problem. Newspapers deliver vital information to communities, as they have since this country was settled. But something has to pay for all of that news. Advertising has traditionally supported the valuable content provided by newspapers. Two developments have devastated that revenue. Tell me what RELEVANT experience you have. Not about writing in-house newsletters for the haulage industry.Then, how about putting all that relevant experience at the top of your covering letter/CV? Where it catches my eye? Instead of squirreling it away down by your signature, as though you’re embarrassed to be thought competent for the job.Put your contact details on your covering letter. Unless, that is, you don’t want to be contacted. I thought about this yesterday as I was speaking to a journalism class at the University of Washington. The instructor, Kathy Gill, asked me at the end of my presentation what 3 things the students in the room should know as they embark on their professional careers. 1. Start a blog on something you’re passionate about and can write authoritatively about and try to grow the readership. Nothing will teach you about the power and responsibility of being publisher as fast or as well. Um dos temas que mais fascina pesquisadores de todo o mundo é o processo de difusão e transmissão de informações entre os atores sociais. Esses estudos têm sido mais e mais freqüentes com o advento da Internet, principalmente porque a Rede permitiu que o acompanhamento das informações devido aos rastros deixados nela. Com isso, estudiosos de diversas áreas têm focado esses processos a partir da perspectiva de redes, e de um modo especial, a partir de pontos de vista mais comuns na Economia, como a teoria dos jogos e as cascatas de informação. É principalmente nesse último tema que quero discutir algumas idéias. As chamadas cascatas de informação (information cascades) ocorrem quando temos um tipo de comportamento (ou decisão) que é repetido por vários atores com base na observação dos demais (influência) e não em uma análise a partir das informações recebidas a respeito. Ou seja, as pessoas repetem as informações baseadas no fato de que outras pessoas estão fazendo assim. O pessoal da Youth Press Portugal organiza hoje uma das suas tertúlias. Eu não vou poder ir, mas recomendo. É em Lisboa. – Qual o papel dos jornalistas na cobertura noticiosa durante períodos de guerra? – Os media permitem à opinião pública um entendimento correcto e independente do que está em causa nos conflitos? – Como lidam os jornalistas com eventuais influências da censura, da propaganda e das técnicas de relações públicas por parte das autoridades envolvidas? 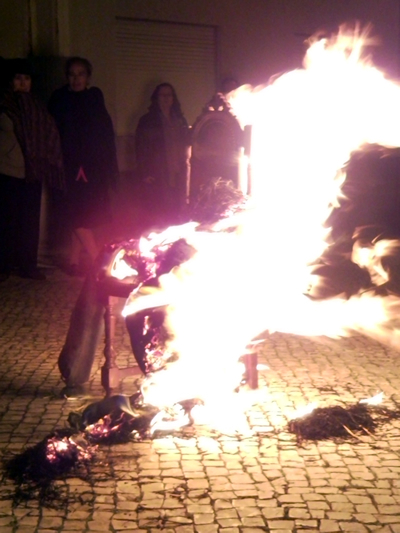 Vem reflectir sobre estas e outras questões, dia 23 de Abril de 2009, quinta-feira, às 21h na Associação 25 de Abril, na Rua da Misericórdia, 95 ao Chiado. Alexandra Lucas Coelho (Público) – Jornalista do Público, actua na área da grande reportagem e da cultura. Em 2005-2006 esteve seis meses baseada em Jerusalém como correspondente. Em 2007 publicou “Oriente Próximo” com narrativas jornalísticas entre israelitas e palestinianos. É autora do blog http://diariodereportagem.blogspot.com sobre o conflito israelo-palestiniano e está a preparar um livro com um diário de reportagem no Afeganistão. Paulo Nuno Vicente (Antena 1) – Jornalista da Antena 1, é também é o autor do blog Jornalismo em Segurança – Report on Safety http://reportsafety.wordpress.com/ , onde partilha as suas experiências como repórter em teatros de guerra. Entre os principais trabalhos destacam-se reportagens na Guiné-Bissau, S. Tomé e Príncipe, Ceuta e Melilla, Líbano, Bósnia, Israel, Cisjordânia, Chade e República Centro Africana. Prepara actualmente um documentário sobre Cabo Verde e Guiné-Bissau para a Associação para a Cooperação entre os Povos (ACEP).